Israeli Occupation Forces (IOF) advanced a limited distance in Palestinian lands to the east of Khan Younis City in southern Gaza on Thursday. Local sources told the PIC reporter that several Israeli military vehicles advanced into lands to the southeastern outskirts of the city in al-Umour district and started leveling of lands. The Israeli forces opened machinegun fires at random and leveled lands during the incursion. No casualties have been reported. On Wednesday, Israeli soldiers opened intensive machinegun fire at Palestinian farmers and fishermen whereas Israeli military vehicles advanced limited area into northern Gaza Strip. The forces stationed at Central Gaza also fired their machineguns at Palestinian farmers forcing them to leave their farms, a field monitor revealed. Israeli gunboats as well started shooting at Gazan fishing boats with no casualties reported. Besides, four Israeli bulldozers advanced a 50-meter distance in northern Beit Lahia in the northern blockaded enclave. 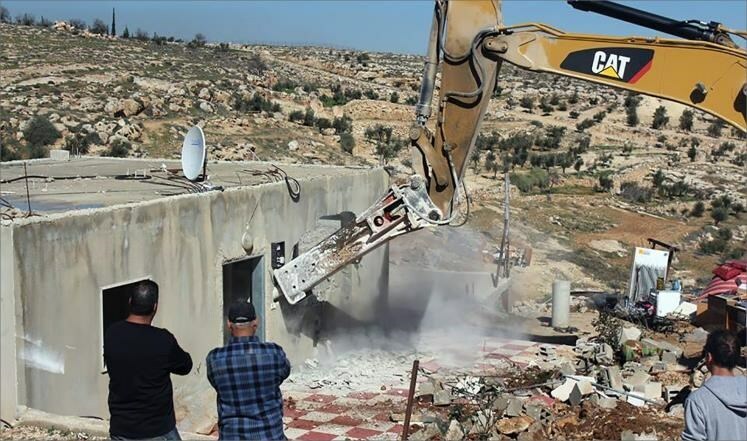 The Israeli Occupation Authority (IOA) ordered on Wednesday the demolition of four Palestinian houses and a halt to the construction of a football playground and a house in Bethlehem in southern West Bank. Eyewitnesses revealed that Israeli military forces handed demolition notices to four Palestinian families ordering them to stop building works in their under-construction houses under the claim that they are established near a bypass road used by Jewish settlers in the nearby Jewish outposts. Those forces also handed a Palestinian family a notice to stop building their under-construction house in the town. Other houses of the town received demolition notices for the same pretext on previous occasions. In a similar context, Israeli occupation forces handed a notice of halting construction of a football playground in another town in Bethlehem, the head of the village council, Ahmad Sukkar, told Quds Press. The IOF claimed that the playground, which has been under construction for two months, is being built on "Israeli state property". 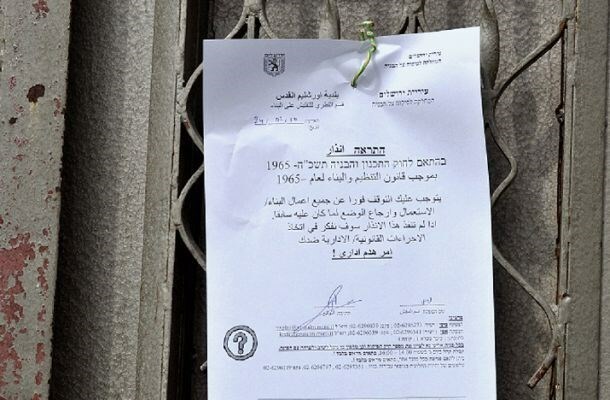 Sukkar pointed out that the notice includes stopping construction works on the location and heading to Israeli courts for appeal within three weeks. He revealed that the IOA had previously issued a similar notice to stop the construction of a park located within the borders of the same area which is considered as "state" lands by the IOA. The U.S. State Department Urges Israel to refrain from demolishing Palestinian village, Susiya in the West Bank... fears a deterioration in standard of policy of indigenous displacement. A group of 21 Members of the European Parliament sent an urgent letter to the EU diplomacy chief Federica Mogherini concerning Israel’s plan to demolish the Palestinian village of Khirbet Susiya. 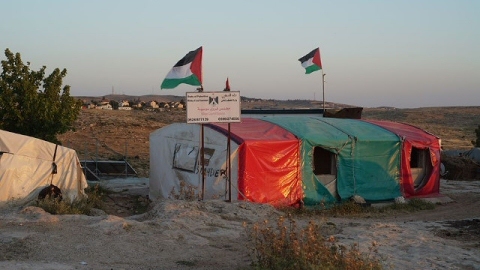 Khirbet Susiya has been under imminent threat of demolition from Israel since May, when the Israeli High Court approved the demolition of the villagers’ homes and tents and possible relocation of the villages around 300 Bedouin residents. “There are approximately 340 men, women and children in the village and 80 buildings of Susiya all of which have demolition orders pending against them. 37 of the buildings are to be demolished imminently, including homes, 22 of which are EU funded, including a medical clinic that is subsidized by the Italian government. The Israeli Court has refused to grant an interim order freezing the implementation of the demolition until the court hears the discussion on the appeal to authorise the village. This situation is unacceptable” – the MEPs say. The letter was initiated by MEP Martina Anderson – chief of the Delegation for Relations with the Palestinian Legislative Council at the European Parliament. “Many of the occupants of the Palestinian village of Susiya are from families expelled from the original site of the village in 1986 to make way for an Israeli archeological park, run by settlers who had established the rival Jewish settlement of Susiya three years earlier” – a group of MEPs explain. 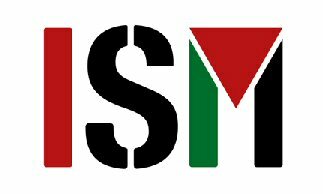 “In the face of such ongoing violations of Palestinian’s human rights we call on you to suspend the EU Association Agreement with Israel. The Agreement is based on mutual respect for human rights and democratic principles, as explicitly stated in article 2 of the Agreement. However the ongoing authorisation of the demolition of Palestinian homes by the Israeli government, as well as several human rights abuses, are in breach of Israel’s commitments under article 2 of the Agreement. 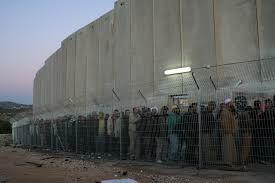 The EU cannot continue to tolerate such actions by Israel.” – the MEPs argue. In addition Palestinian and Israeli organisations are calling on the EU not to let Israeli settlements gain from plunder and restrict the sale of all Israeli settlement products in Europe. In particular to bar the importation of Carmel Wines as some of the grapes grown by settlers in Susiya have been documented going to the Carmel Winerygoing to the Carmel Winery, which sells its products in Europe. Here you can find the list of other corporations profiting from the theft of Susiya land. 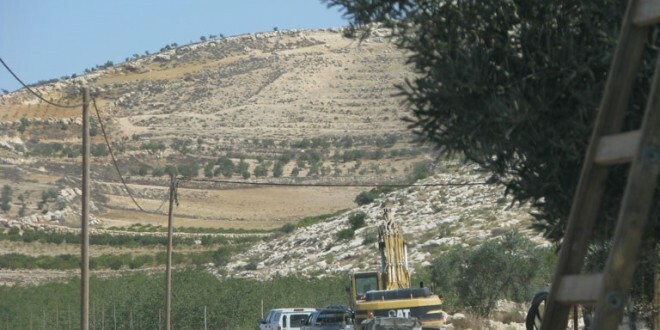 Israeli Occupation Forces (IOF) on Wednesday morning have uprooted a number of trees, destroying an agricultural land in Beit Oula village near Hebron, under security pretext.Local sources in the village said that bulldozers razed the land in presence of intensified military units. Following the raze, IOF have kidnapped a child aged 14 from Hebron old city, and another aged 23 on the Gush Etsyon crossroad, north of Hebron. Israeli Occupation Forces (IOF) on Wednesday leveled lands and uprooted olive trees in Beir Oula to the west of al-Khalil city in the southern West Bank. Issa al-Emleh, activist against settlement, told the PIC reporter that Israeli bulldozers have been leveling lands and uprooting olive trees since the morning. The olive trees aged over ten years and the lands belong to al-Emleh family, he pointed out. The activist Emleh added that the leveling works included dozens of dunums in the area. The Israeli authorities claim that it is part of Israeli properties. 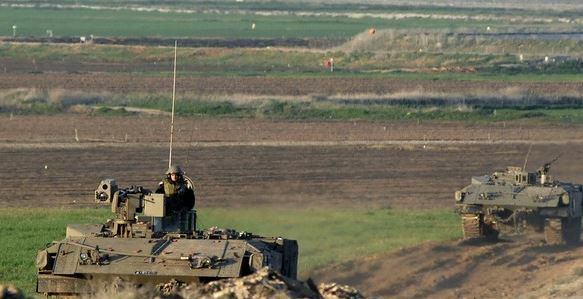 Several armored Israeli military vehicles carried out, earlier on Wednesday, a limited invasion into Palestinian agricultural lands, north of Beit Lahia, in the northern part of the Gaza Strip. Army also fired on farmers and their lands, in central Gaza. 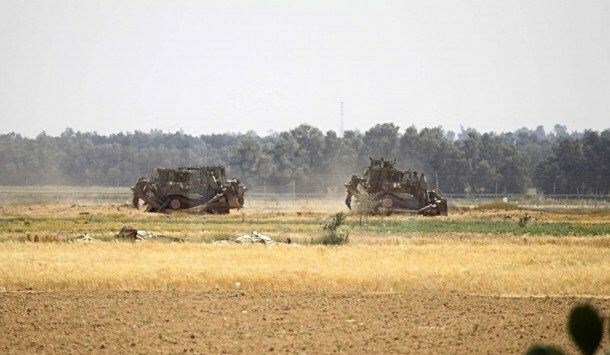 The WAFA News Agency said four tanks and three armored bulldozers, stationed in a military base across the border fence, advanced at least 150 meters into Palestinian agricultural lands. The military bulldozers then bulldozed and uprooted agricultural lands, and installed sand barriers while firing rounds of live ammunition at homes and property in the area. In addition, soldiers stationed on military towers near the border fence, in central Gaza, fired live round agricultural lands, east of the al-Maghazi refugee camp, forcing the farmers to leave their land, in order to avoid further army fire, and escalation. The Israeli army and the navy conduct daily violations against the Palestinians, their homes, lands and property in different parts of the coastal region. On Tuesday at dawn, two Palestinian fishers were wounded after Israeli navy ships opened fire on a number of fishing boats in Gaza waters, near Beit Lahia. Ayelet Shaked seeks to organize status of West Bank settlements by establishing a committee that would provide legal solutions to issue of land ownership. Justice Minister Ayelet Shaked of Bayit Yehudi has recently begun the process of establishing a committee to organize the legal status of land plots in the West Bank. 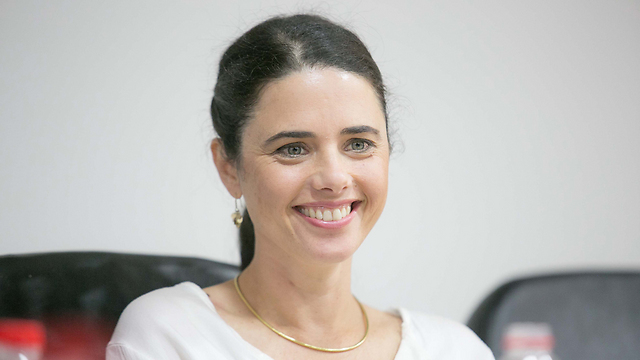 According to Shaked, the committee's establishment means residents of the West Bank will cease fearing the threat of land ownership disputes. The coalition agreement between Bayit Yehudi and Likud includes a clause which calls for establishing a professional panel that would discuss proposals seeking to organize the status of buildings and neighborhoods within Jewish settlements in the West Bank with the relevant authorities. According to the clause in the agreement, the panel must submit its findings to the government within 60 days of its establishment, which the government will then act to implement. The committee is currently in the process of being established, and will be led by Cabinet Secretary Avichai Mendelblatt. The team will include Director General of the Agriculture Ministry Shlomo Ben Eliyahu, the legal adviser to the Ministry of Defense Ahaz Ben-Ari, and Dr. Hagai Vinitski. The status of land plots in the West Bank is legally ambiguous. There have been several legal commentaries that seek to answer crucial questions like which lands are considered private, and what proof is necessary in order to establish private ownership of the land. The state has been struggling to reach any conclusions on the matter for years, and many plots of land have remained without a clear legal status. The committee is meant to find solutions to organize the issue of settlement and to solve disputes over land ownership. "There are many areas in Judea and Samaria, whose legal status has not been organized," Shaked said. "Its time to remove the legal ambiguity, and allow the residents of Judea and Samaria, many of whom live in settlements that where built by the Israeli government, to live without the persistent fear of challenges to their property ownership," she concluded. The Israeli justice ministry established a committee Tuesday that "legalize" the settlements set up on the West Bank lands. Israeli cabinet secretary Avichai Mendelblit will head the committee, which had been called for in the coalition agreement between Naftali Bennett’s Habayit Hayehudi and Benjamin Netanyahu’s Likud. It will submit its conclusions in 60 days, according to Al Ray. The committee will include Director General of the Agriculture Ministry Shlomo Ben Eliyahu, the legal adviser to the Ministry of Defense Ahaz Ben-Ari, and Dr. Hagai Vinitski. According to Israeli justice minister Ayelet Shaked, the panel will discuss formulating an outline for regularizing the settlements outposts built in West Bank lands with the involvement of Israeli authorities. Skaked said that the status of settlements plots in the West Bank is "legally ambiguous" and it is the time to clear the legal fog. She noted that the committee comprises land experts, jurists and directors general. It is noteworthy that Israeli civil administration in the West Bank is set to grant permits for the construction of 906 new housing units on Thursday, which is the first approval in a year. Haaretz paper reported that the permits are seen as being part of an attempt by Defense Minister Moshe Ya’alon to appease settler leaders following a High Court ruling that two illegal structures in the settlement of Beit El must be demolished. It approved the construction of 296 units inBeit El, to be built on the site of a Border Police base that will be evacuated. This construction is compensation for Beit El’s agreement to evacuate five buildings on the site known as Ulpana Hill, which had been built on private Palestinian land. In other parts of the West Bank, 112 new units are to be built in Ma’ale Adumim on a 50-dunam site originally zoned for public buildings. 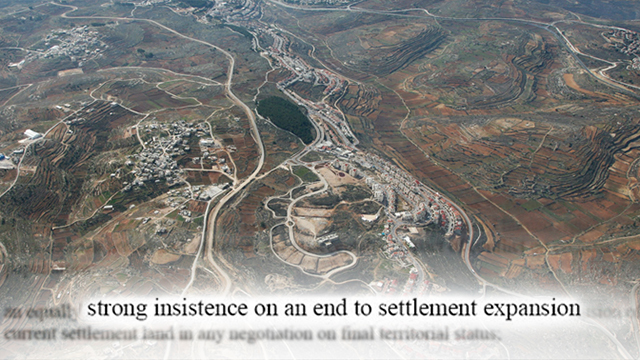 The Ma’ale Adumim municipality gave up its claim to the area, giving the green light to the residential construction. In Givat Zeev, 381 new units will be built in a 152-dunam area in the neighborhood known as Agan Ha’ayalot, and will be earmarked for an ultra-Orthodox population. In the settlement of Psagot, 24 buildings that are already standing will be retroactively approved. This is a complex built by the settlement association Amana, which is responsible for most of the illegal construction in the West Bank. The Israeli army bulldozers on Tuesday knocked down civilian structures and barracks in al-Khalil’s western town of Idna. 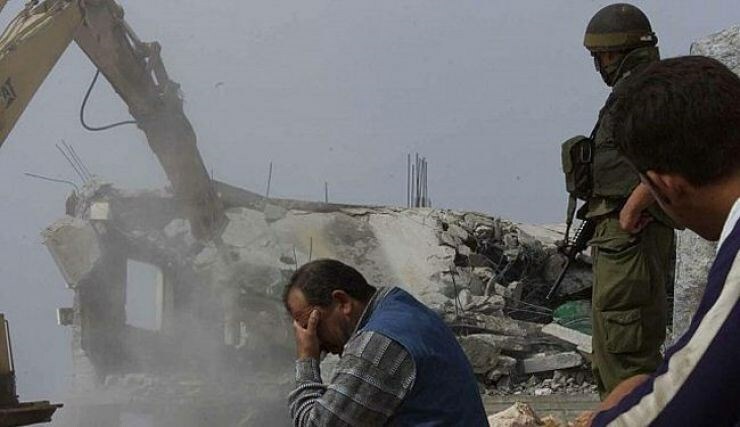 Local sources said the Israeli bulldozers, escorted by large army troops and jeeps, rolled into Idna town and demolished three commercial barracks under the pretext of unlicensed construction. In a related context, the Israeli occupation forces (IOF) kidnapped four Palestinian citizens from al-Khalil city. Locals said the IOF soldiers broke into civilian homes in al-Khalil’s neighborhoods of al-Hawouz, the Old City, and Bani Na’im moments before they rounded up four allegedly wanted citizens and dragged them to an investigation center. 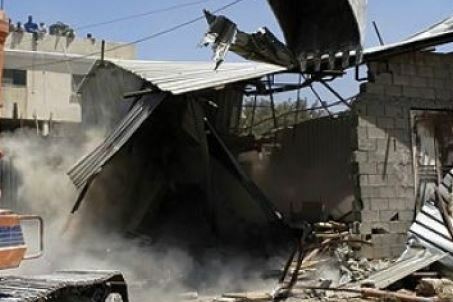 Israeli soldiers demolished, on Tuesday morning, two sheds and a store, in Ethna town, west of the southern West Bank city of Hebron. Sources in the Ethna Local Council said several military vehicles, and a bulldozer, invaded Khallet Ibrahim area, west of the town, and demolished a shed, used for selling spare parts and metals. The demolished shed belongs to resident Sa’id Fayez Sleimiyya. In addition, the soldiers demolished a shed, and confiscated equipment, belonging to Marwan Hilmy Tmeizi, and store belonging to Husam Sha’rawi, near the Local Council building in the town. Israeli settlers, Monday, put up banners in multiple areas in Bethlehem district calling for more Palestinian lands to be confiscated for the purpose of settlement construction and expansion, according to local and security sources. Ahmad Salah, coordinator of the Anti-Settlement Committee in the village of al-Khader, south of Bethlehem, said a group of settlers arrived at the entrance of the village and set up large banners warning of a new round of “struggle for land” and a rise in settlements activity. A meeting of EU foreign ministers blasts Israel for what it says are actions that 'seriously threaten the two-state solution', while embracing a new international peace plan that would bring Israel and the Palestinians back to the negotiating table. The foreign ministers of the European Union on Monday discussed a new plan to push Israeli-Palestinian peace, and did not hold back on listing what they perceived to be obstacles to peace, including what they termed "forced transfers", settlements, and the building of the "separation barrier" beyond the green line. A list of decisions made at the meeting stated that among other things, the EU "calls on Israeli authorities to halt plans for forced transfer of population and demolition of Palestinian housing and infrastructure in the Susya and Abu Nwar communities." The decision went on to state that the EU "reiterates its strong opposition to Israel's settlement policy and actions taken in this context, such as building the separation barrier beyond the 1967 line, demolitions and confiscation – including of EU funded projects – evictions, forced transfers including of Bedouins, illegal outposts, settler violence and restrictions of movement and access." The statement concluded that "these actions seriously threaten the two-state solution." The ministers also condemned recent violence emanating from Gaza: "Recent rocket fire by militant groups is unacceptable and underlines again the danger of escalation," they warned. The same meeting saw EU diplomats discuss the new push towards Israeli-Palestinian peace through international organizations. "The EU, notably through the action of its recently appointed Special Representative for the Middle East Peace Process, will work actively on a renewed multilateral approach to the peace process in consultation with all relevant stakeholders, including partners in the Quartet, notably the US, in the region and the United Nations Security Council," read the document. Building on a French proposal, the EU foreign ministers agreed to create an "international support group" more than a year after the collapse of a US-brokered peace push envisaging a Palestinian state co-existing with Israel. The EU wants to open the door to more countries to get involved. French Foreign Minister Laurent Fabius recently presented the Arab League with a detailed plan to renew peace talks between Israel and the Palestinians. The plan stipulates the formation of a Palestinian state in the pre-1967 lines, with swaps of mutually agreed upon lands similar in size, while taking into account Israel's security needs. France has said that if a two-state solution was not reached by the end of the allotted 18 month period of negotiations, France would announce its official recognition of the State of Palestine. "This week tells us that diplomacy in the long run can deliver," EU foreign policy chief Federica Mogherini said, referring to the July 14 deal in which Iran agreed to curb its disputed nuclear program in return for an end to sanctions. The EU foreign ministers' plan envisages obtaining formal approval for the so-called support group at the UN General Assembly in New York in September, then a UN Security Council resolution to set parameters for a peace deal. Deep internal divisions within the 28-nation EU over Middle East policy, which limit its ability to take an active role, are among the reasons for seeking an international coalition. Participants in the Iran nuclear accord were world powers Russia, China, the United States, Britain, France and Germany. EU diplomats see a chance to involve many more countries than those in the Middle East Quartet – the United States, the United Nations, the European Union and Russia – that has promoted Israeli-Palestinian peacemaking with little practical effect. Under the EU proposal, the permanent members of the UN Security Council, the larger European economies including Spain and Italy, and Arab nations could play a bigger role. Mogherini, who met with Prime Minister Benjamin Netanyahu and Palestinian President Mahmoud Abbas in May, sees a chance for EU diplomacy in the absence of a new diplomatic initiative from Washington as President Barack Obama approaches the end of his final term. While the central players in the nuclear negotiations were Iran and the United States, senior EU officials played a central role in mediating negotiations, becoming the unsung heroes of the deal and giving EU diplomats confidence to do more abroad. "The (Israeli-Palestinian) peace process is at a standstill. The situation is bad. Europe should help both parties to take steps to overcome the impasse," French Foreign Minister Laurent Fabius said. Israeli Occupation Forces (IOF) distributed notices to stop building of Palestinian houses under construction in Beit Ummar town in al-Khalil on Sunday. The spokesman of the Popular Committee against Settlement in Beit Ummar, Mohammad Awad, said that Israeli soldiers escorted by members of Israeli Civil Administration stormed Beit Ummar on Sunday morning and distributed notices ordering three families to stop construction works of their houses. Awad pointed out that the areas of the houses ranged between 100 and 150 square meters. One of the houses is at an early stage of construction, the second is already under construction and the third is almost finished, he added. Awad said that Beit Ummar town has always been targeted by Israeli Occupation Forces (IOF) and Israeli Civil Administration. He also pointed out that the owners of the houses possess official documents that allow them to work and build in their lands.